I recently became endorsed by a Registered Training Organization & Qld Police to provide the mandatory firearm safety courses that are required for a new license applicant. I had a quick shop around and found a new Savage MKII stainless steel in .22lr. These are a perfect rifle for training as they are light enough for a minor (11+ here in Qld), have zero recoil, and being stainless steel, will be more forgiving if I just put it away in the safe without cleaning it. I chose a synthetic stock as it will surely take a few knocks at the range by some new shooters. I borrowed this picture of the rifle from NIOA. (Hello Rob!). Whenever I purchase a new bolt action, I'll spend the evening just working the action until the bolt slicks up into a nice, smooth and easy action with no binding. My daughter gets really mad at me whilst I'm doing this as it interrupts her TV viewing. "You're too noisy Dad!" I took the Savage to the range to test for function and suitability. It feeds from the 10 shot magazine extremely well and the bolt had slicked up beautifully, enough to glide back and forth within the action with very little effort required. I mounted my Leupold Mk4 4.5-14x40 scope to Weaver bases supplied with the rifle to see what kind of accuracy the rifle was capable of. Bulk pack ammunition from both Federal and Winchester had me shooting 2" groups from the bench at 50 yards. This more than acceptable from an inexpensive, lightweight sporting rifle. I'm certain the rifle would shoot smaller groups with premium match ammunition, however this rifle is all about teaching students the ins and outs, the do's and dont's of firearm safety, not how to shoot like a marksman. An opportunity arose to field test the rifle when visiting relatives in NSW. By this time I had taken off the MK4 Leupold and fitted my extremely old yet dependable Japanese made Bushnell Banner 3-9x40. After the kids had all gone to bed, I grabbed my bright as hell Chinese made LED torch and took a casual stroll down the back paddock. A quick scan revealed a nice set of glowing eyes crouched low in the grass. At first I thought it was the house cat, so I let out a little squeal and the eyes raised from the grass. Bang! The fox took about 10 steps at breakneck speed before falling. What does the fox say? Not much, but he was a little stiff the next morning! 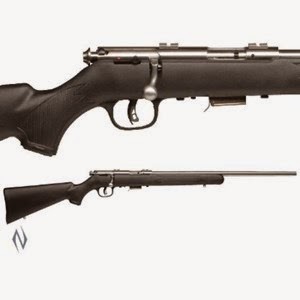 I am happy with the rifle and it will be well suited to training new shooters for their A&B licenses. I have purchased a few more rifles and I'll write some about those soon. Stay tuned!